The French assault on the Russian positions on the Wkra and Narew rivers on 23-4 December 1806 is described in a number of English language sources and in particular detail in F. Loraine Petre’s Napoleon’s Campaign in Poland, 1806-7. While the actions of the French 3rd corps at Czarnowo and Nasielsk and the 7th corps at Kolozomb and Sochocin are thoroughly covered, Petre fails even to mention the activity of the French cavalry operating between these larger forces and their encounter with a Russian detachment at the town of Borkowo. Aside from being an interesting story, the action at Borkowo forms an important part in the overall understanding of the operations leading up to the battles of Golymin and Pultusk. On the morning of 24 December 1806, the Russian troops of Major General Ivan Semenovich Dorokhov waited at Borkowo for the expected French attack. Word had arrived that morning that the French had attacked the strong Russian position at Czarnowo, about 10 kilometers southeast of Borkowo. Forcing a bridgehead across the river line during the night, the French had driven the Russian forces of Lieutenant General Alexander Ivanovich graf Ostermann-Tolstoi from their positions. Ostermann’s forces had begun retiring on Nasielsk, about 9 kilometers east of Borkowo under cover of their rearguard around 4:00 that morning. The task of covering Ostermann’s right fell to Dorokhov’s command, which had been detached from Ostermann’s 2nd Division. Dorokhov commanded one of a number of small detachments positioned at key points along the line of the Narew and Wkra rivers, part of the defensive arrangements set up by Lieutenant General Levin Bennigsen about ten days earlier. Other detachments covered the main river crossings at Zegrze, Debe, Czarnowo, Kolozab and Sochocin. The Russian light cavalry – hussars and uhlans – were distributed among the detachments along with Cossack regiments, which performed their traditional scouting roles by patrolling the river line between the posts. This first line of defense was intended as a “tripwire” to alert the Russian command to the direction of any French offensive and to slow any French advance, buying time for the Russians to concentrate their forces to counter the French movements. Dorokhov’s position at Borkowo was not a particularly strong one, lacking any commanding terrain aside from the river itself. The town of Borkowo lies on the right (west) bank of the Wkra river as it makes a broad curve to the south, almost exactly midway between Pomiechowo and Kolozab - approximately 10 kilometers from either town and roughly 9 kilometers from Nasielsk. Immediately to the west of Borkowo there is a substantial rise, referred to in French reports as the “heights of Wola” that forces the course of the Wkra to turn eastward before again resuming its southeasterly course. The Wkra passes below these heights on two sides with Wola (Dobra-Wola) standing below the heights to the north and Borkowo below the heights to the east. South of Borkowo, the ground on the right bank levels out for a considerable distance from the river as it winds its way to the Narew. The opposite bank of the Wkra appears to be generally level with gentle undulations. Directly opposite Wola and a short distance from the river was the town of Cieksyn. A short distance to the south of Borkowo on the left bank stands the village of Lelewo. Below Lelewo, the Wkra makes another broad curve to the west, curling around a rise similar to the heights of Wola on the left bank and some 4 kilometers to the southeast of Borkowo. The Wkra river is fairly wide and deep this area, but is fordable at a number of points, including just below Lelewo and at several points to the north between Borkowo and Kolozab. The entire area around the Wkra and Narew rivers was in general heavily wooded and the area in the immediate vicinity of Borkowo was no exception. Detailed period maps of the area are hard to come by, but 19th and early 20th Century maps show extensive forests on the right bank of the Wkra opposite Borkowo and stretching south to Pomiechowo, although it seems that the area immediately adjacent to Borkowo was clear. On the left bank, open fields or meadows stretched from Cieksyn on the north to Lelewo on the south and continued eastwards nearly as far as Nasielsk. Forests blanketed the country to the south and northwest of this area. followed the left bank of the river to Cieksyn and from there up the left bank of the Sona. Dorokhov’s command was composed of elements drawn from Ostermann’s 2nd division and Major General Mikhail Bogdanovich Barclay de Tolly’s Advance Guard (Part of 4th division). The infantry consisted of one jäger battalion from either 3rd or 1st Jäger Regiment. Supporting the infantry were 3-5 squadrons of Isoum Hussars, Ilowaisky-IX Cossacks, and a half battery of horse artillery (6 guns). As of 23 December, Dorokhov had his main force positioned on the high ground in front of Borkowo with detachments at Gadowo (cavalry) and Bledowo (infantry, cavalry and artillery) anchoring the right and left of the position. In all, Dorokhov’s force included approximately 5-600 infantry and 1,000 hussars and Cossacks. French cavalry conducting a reconnaissance of the Russian positions on the 23rd alerted Dorokhov to a probable French attack on the 24th. Dorokhov recalled the detachments of infantry, artillery and hussars from Gadowo and Bledowo to concentrate them at Borkowo early on 24 December, either as a result of the French presence at Wola-Bledowska or reports of the action at Czarnowo and Ostermann’s retreat. By mid-morning on the 24th Dorokhov had deployed the bulk of his forces on the left bank of the Wkra, concentrating the artillery in a battery covering the bridge and supported by the battalion of jäger. At least 3 squadrons of hussars were positioned in reserve while the Cossacks remained somewhat scattered in posts along the Wkra. Skirmishers remained on the high ground west of Borkowo to harass the French advance. Opposing Dorokhov were the 1st Dragoon Division of Général de Division Dominique Louis Antoine Klein and the Light Cavalry Brigade of Général de Brigade Antoine Charles Louis Lasalle. Klein’s division was composed of 6 regiments of dragoons – the 1st, 2nd, 4th, 14th, 20th and 26th – a total of some 2,300 officers and men. Lasalle’s brigade consisted of two regiments of hussars, the 5th and 7th, with roughly 1,000 officers and men. A half battery of horse artillery, the 2nd Company of the 2nd Regiment Horse Artillery, was attached to Klein’s division. Lasalle’s hussars, who had conducted the reconnaissance of the Russian positions on the 23rd, had assembled at Wola-Bledowska by that evening and were joined there by the 1st and 2nd Brigades of Klein’s division. Klein’s 3rd Brigade stood at Janowo. Their orders, issued from headquarters at 4 AM on the 24th just as the Russian force at Czarnowo was beginning its retreat, directed them to advance on Borkowo. The French cavalry was to force a crossing of the Wkra either by way of the bridge at Borkowo or by a ford, after which they were to operate on the left bank of the Wkra to support the general offensive operations in the direction of Nasielsk. From this central position they would form a link between the victorious 3rd Corps advancing from Czarnowo and 7th Corps, which had been ordered to advance on Nowemiasto by way of the Wkra crossings at Kolozab and Sochocin. With Ostermann’s forces retiring on Nasielsk from their positions at Czarnowo and Debe, Dorokhov was responsible for holding his position against any French attack to buy time for the remainder of 2nd Division to retire. By 8 AM on 24 December, the troops from Czarnowo had begun arriving at Nasielsk. After only a few hours of waiting, Russian pickets occupying the high ground on the right (west) bank of the river reported the approach of a large body of French cavalry. Dorokhov recalled his advance posts on the far side of the river to the left (east) bank around 11 AM and made preparations to destroy the bridge to slow the French advance. Klein and Lasalle began their march around 8 AM, reaching the high ground overlooking Borkowo around 11 AM where they encountered Dorokhov’s skirmishers. During the advance, pickets of 50 men each were sent to occupy observation posts on the right bank of the Wkra at Zatoka and Kosewko to the south of Borkowo while other pickets were sent ahead as far as Gadowo and Wrona where they made contact with detachments of 7th corps. Klein positioned a brigade of dragoons and three guns on the heights of Wola while the remainder of the force (less the various detachments) appears to have been positioned in and behind the town of Borkowo. By noon the French forces were fully assembled and in command of the ground overlooking the river crossing, just as cannon fire to the north announced the commencement of 7th Corps’ attack. Klein’s horse artillery began its bombardment of the Russian positions across the river, the Russian artillery returning fire. On the Russian side, the situation soon changed from one of holding the position to one of extricating themselves from it. Field Marshal Mikhail Fedorovich graf Kamensky, commander in chief of the Russian forces, had arrived at Nasielsk in person around noon. Surveying the Russian forces and being informed of the French assaults on the Wkra line, Kamensky concluded that the position at Nasielsk was too exposed and ordered a general concentration further to the northeast at the small village of Strzegocin. By 12:30 Kamensky had ridden off in the direction of Kolozab to see first-hand the situation of Barclay. With the majority of 2nd Division now on the march from Nasielsk to Strzegocin with only a small rearguard left at Nasielsk and Barclay’s forces at Kolozab under heavy attack, Dorokhov’s position was substantially less secure than it had earlier seemed. Although the French cavalry that had arrived at Nasielsk on the heels of the Russians was powerless to dislodge them in the face of the infantry, cavalry and artillery already in position, French infantry and artillery was sure to arrive soon. While Dorokhov’s forces held the French cavalry at bay, Klein disposed his forces to turn the Russians out of their position, sending Lasalle’s two regiments and the 20th Dragoons probing to the south in search of a ford. Lasalle’s men located a ford just south of the village of Lelewo. Finding no enemy force worth mentioning to oppose him, Lasalle began crossing the ford in force. It appears that Cossack patrols reported Lasalle’s activities to Dorokhov. Hearing the heightened artillery fire that announced the arrival of strong French forces at Nasielsk around 1:30, and perceiving the threat to his left posed by Lasalle’s crossing at Lelewo, Dorokhov determined that it was time to withdraw. Firing the bridge around 2 PM, the Russians pulled back towards Cieksyn, leaving skirmishers to harass the French in any attempts to put out the fire and save the bridge. With the bridge now in flames, Klein ordered a body of dragoons to dismount. While some maintained a withering counter fire against the Russians on the opposite bank, others worked to extinguish the blaze on the bridge. The Russian skirmishers, outnumbered, gradually fell back and within an hour the fire was under control and parties were working to repair the damage even as the last of the flames were being extinguished. By 3 PM the bridge had been made passable and Klein’s dragoons and artillery started across. Once across, Klein’s forces scattered to fulfill their mission of sweeping the area between 3rd and 7th Corps and forming a link between them. 14th dragoons secured Ruszkowo and Morgi, while another regiment shadowed the Russians as far as Zeledowo. Behind this perimeter, the 4th Dragoons secured the bridge at Borkowo while the two remaining regiments advanced to Cieksyn where Klein made his headquarters. Lasalle had meanwhile advanced from Lelewo on Klein’s right towards the Russian position at Ciexin. Dorokhov, seeing no purpose in remaining at Ciexin, divided his forces. Part retired towards Nowemiasto (probably the infantry and artillery) while the remainder, under Dorokhov’s own command, fell back towards Nasielsk. Lasalle left the 20th Dragoons to secure his right at Czajki and Mokrzyce-Dworskie and with his chasseurs set off in pursuit of Dorokhov’s cavalry. Dorokhov arrived at Nasielsk at the head of his hussars shortly before dark. As darkness fell, the Russian rearguard at Nasielsk withdrew towards Strzegoczin, leaving the exhausted French to bivouac on the field of battle. Lasalle’s chasseurs had followed Dorokhov as far as Piescirogi, 3 kilometers from Nasielsk. 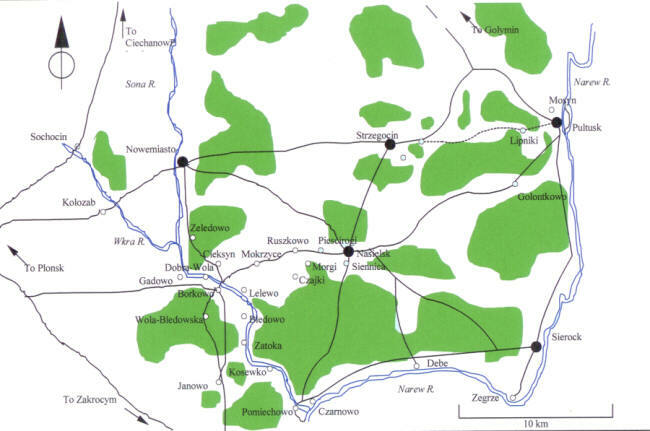 Lasalle’s patrols reported the presence of the carabiniers of 12th Ligne at Siennica and 12th Chasseurs at Nasielsk (elements of 3rd Corps), indicating that matters at Nasielsk were well in hand. Casualties for the action at Borkowo are not specified in sources, but would appear to be very light on both sides. Both Russian columns retiring from Borkowo – the cavalry by way of Nasielsk, the infantry and probably also the artillery by way of Nowemiasto – arrived at the designated point of concentration at Strzegocin late in the night of 24-5 December. Although the action had been minor, Dorokhov had held his position at Borkowo long enough to preserve the rearguard position at Nasielsk until nightfall, allowing the Russian forces to concentrate as planned. The only serious criticism that can be leveled against Dorokhov is the ineffectiveness of his attempt to destroy or even seriously damage the bridge at Borkowo. For the French, Klein and Lasalle had succeeded in securing the right of the advancing 3rd Corps and maintaining communications with the 7th Corps as ordered, pushing all opposition out of their way in the process. Overall, both sides could claim to have performed well and professionally in this all-but-forgotten episode. “Le Général Nansouty au Major Général, Ianowo, 23 décembre 1806 ” in Foucart (see below), p. 402. “Le Général Nansouty au Major Général, Ianowo, 23 décembre 1806 ” in Foucart (see below), p. 402-3. “Le Major Général au Général Belliard, Okunin, 24 décembre 1806, 4 heures du matin” in Foucart (see below), p. 424-5. “Le Général Belliard au Major Général, Ianowo, 24 décembre 1806” in Foucart (see below), p. 425. “Le Général Belliard au Major Général, Ciexin, 24 décembre 1806” in Foucart (see below), p. 426-8. “Le Général Lasalle au Général Nansouty, Piescirogi, 24 décembre 1806 ” in Foucart (see below), p. 428-9. “Le Général Lasalle au Général Nansouty, Piescirogi, 24 décembre 1806 ” in Foucart (see below), p. 429. Bennigsen, Leonty Leontyevich, count von. Mémoires du Général Bennigsen Vol 1; 1908. Foucart, Paul Jean. Campagne de Pologne Vol. 1; 1882. Höpfner, Eduard von. Der Krieg von 1806 und 1807 Vol. 3; 1851. Lechartier, G La Manoeuvre de Pultusk 1911.
imperatora Aleksandra s Napoleonom v 1806 i 1807 godakh 1846. Excerpts translated by Boris Megorsky (unpublished). Plotho, Carl von. Tagebuch wahrend des Krieges Zwischen Russland und Preussen 1811. Wilson, Sir Robert. Brief remarks on the character and composition of the Russian army, and a sketch of the campaigns in Poland in the years 1806 and 1807 1810. Strength estimates are not reported for these forces, but the rough estimates can be based on typical strengths for similar units at this point in the campaign. There are a number of ambiguities regarding the exact composition of Dorokhov’s force on 24 December. Dorokhov had three battalions on 18 December, two from 1st Jäger and one from 3rd Jäger. It is possible that Dorokhov had a second battalion under his command on the 24th, although French reports note only a single battalion. Also, it is not clear if all 5 squadrons of Isoum Hussars were in the immediate vicinity of Borkowo or not. Two squadrons of Isoum Hussars originally assigned to Dorokhov’s detachment may have been involved in the battle of Czarnowo and retired with Ostermann’s force on Nasielsk on the 24th based on the account given by Mikhailovskii-Danilevskii. Descriptions of the general dispositions of the Russian forces on 23-4 December note Cossack patrols scattered up and down the Narew and Wkra rivers. It seems likely that some Cossack patrols were in the vicinity of the Lelewo ford, but were not strong enough to oppose the crossing of Lasalle’s force of nearly 1,400. The fact that Lasalle’s turning movement did not surprise Dorokhov supports the conjecture that the Cossack patrol(s) reported the news of Lasalle’s crossing to Dorokhov in a timely fashion.